Wine, vines, and sunshine predominate on this private tour through the Tuscan countryside. After touring a local winery, hike for roughly two hours through vineyards, rolling hills, and old-growth forests en route to a winery, where a traditional lunch paired with five wines awaits. 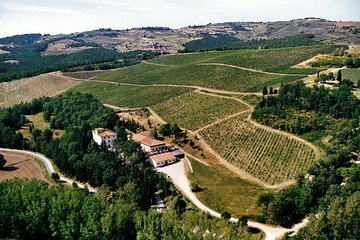 Stop to tour the small Chianti villages of Montefioralle and Greve before completing your tour with an olive orchard tour and oil tasting. We had an amazing time on this tour. Stefano was our driver and guide and he did a great job explaining the history and geography. He took us to the Chianti region and stopped to let us take photos of the gorgeous countryside. We arrived at the Chianti Classico vineyard and met with our personal hiking guide. Marco Antony was our hiking guide and he was super knowledgeable about the land, vines, and history. The hike was a mild 3 mile hike that took about 2 hrs. When we returned to the vineyard house, we were greeted by the property manager who led us to a fresh farm lunch with paired wine tastings. It was amazing! We then went to Greve and toured the local shops, we purchased cheese from the local market and it was fantastic! After that, Stefano drove us to an Olive Oil property close to Florence that was truly a gem. The owner Elenore greeted us and was so warm and welcoming. We toured the spectacular property which included a small private chapel that was breathtaking. The oil we tasted was the best we had in Italy and we wish we had purchased more! We really had an amazing time on this trip!